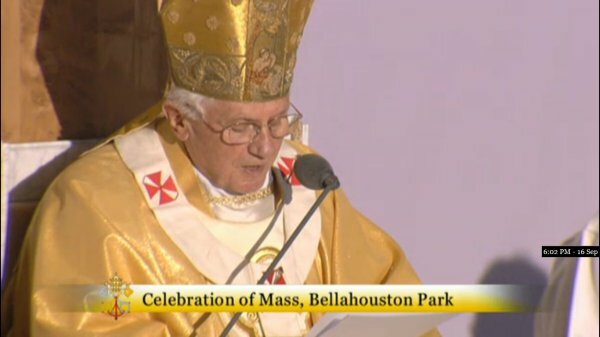 Pope: "Dictatorship of relativism threatens man's nature, destiny and ultimate good"
At the Mass at Bellahouston Park this evening, the Holy Father has just finished his sermon. He mentioned the previous visit of Pope John Paul who was "welcomed by the largest crowd ever gathered in Scottish history". That was a good aside to drop in, and an important reminder to the whingers. The evangelisation of culture is all the more important in our times, when a "dictatorship of relativism" threatens to obscure the unchanging truth about man's nature, his destiny and his ultimate good. There are some who now seek to exclude religious belief from public discourse, to privatise it, or even to paint it as a threat to equality and liberty. Yet religion is in fact a guarantee of authentic liberty and respect, leading us to look upon every person as a brother or sister. Pope Benedict also mentioned the three medieval universities founded by Popes, including St Andrews which is beginning to mark the 600th year of its foundation. The whole sermon, as with this morning's address to the Queen, show that the Holy Father has not only determined to engage politely but firmly with the dictatorship of relativism, but has been expertly briefed in order to get this message home with local references to the work of the Church in education, and to the saintly monarchs and confessors of Scotland.